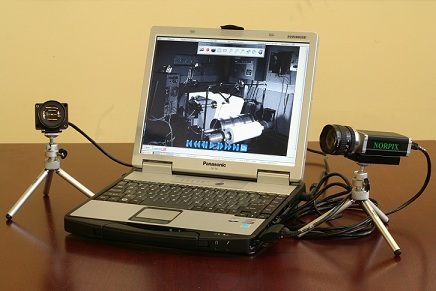 High Speed portable troubleshooting camera capture system at 500 fps. High speed portable troubleshooting system. Portable high speed video troubleshooting system. Record, playback and review simultaneously. Supports a wide array of GigE Vision, USB3, Camera Link and CoaXPress cameras. Pre/Post triggering using usb trigger input. Alternative solutions available from 30 to 8000 fps and VGA to High Resolution. 1 camera at 500 fps x 640 x 480 x 8 bits mono or color. Record for over 220 minutes in uncompressed format. Record for over 27 hours at 75% JPEG compression ratio. Available for GigE, USB 3 or camera link cameras. 2 cameras at 500 fps x 640 x 480 x 8 bits mono or color. Record for over 110 minutes per camera in uncompressed format. Record for over 31 hours at 75% JPEG compression ratio. Available for USB3, GigE or camera link cameras. StreamPix multiple camera with Pre/Post triggering.